Why dirty more dishes than you have to? 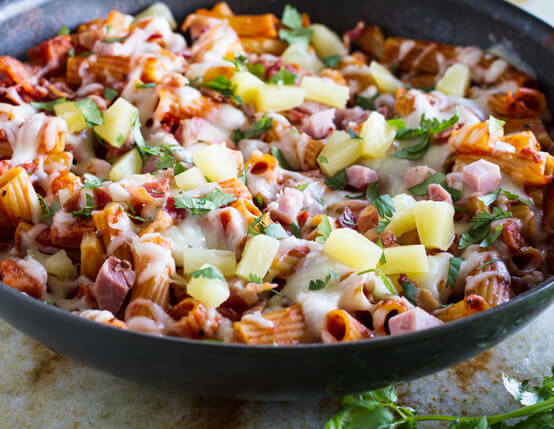 This innovative one-pan dinner features Jones ham, pasta and pineapple. Dice bacon into small pieces. Heat large skillet over medium heat and add bacon. Cook until crisp. Remove bacon with slotted spoon to paper towel lined plate to drain. Discard all but 1 tablespoon of bacon grease. 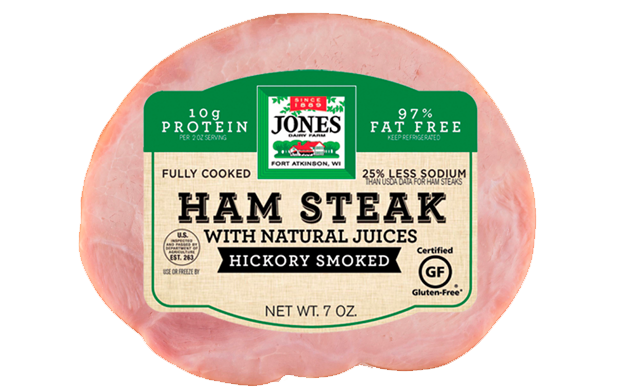 Add cubed ham to skillet. Cook, stirring frequently, until ham is browned. Add tomato sauce, chicken broth, onion powder, basil, salt and pepper; stir to combine. Add pasta and stir. Bring mixture to a boil, then cover and cook until pasta is tender, about 15 minutes. Stir in pineapple and reserved bacon, then remove from heat. Sprinkle top of pasta with mozzarella and cover. Let sit until mozzarella is melted. Sprinkle with cilantro before serving.